The Night Circus Blog Tour: Review & Giveaway! In the most simplest of explanations; this is a story of how a magical circus came to be and the deadly game that inspired it. But you soon discover it is so, so much more than that. It is not just a love story or a few magical tents to marvel at. It is not just the unfair competition Celia and Marco have been trained for their whole life, bound together at childhood. It's all of these and more, wound together to form something more breathtaking and complex than I first imagined. And it is nothing that I can adequately describe or give justice to in these few paragraphs. While we're given multiple perspectives than span across a thirty year period, Celia and Marco are more the main characters. The two at the heart and soul of this tale. Unwilling competitors, but with no choice in the matter, they partake in a game unaware of the rules or what will determine a winner. The circus acts as their venue - though it becomes more tangled in their game than they initially realised - where each must continually make their move, constructing pieces of magic and art more breathtaking than the last. But this act has an air intimacy to it, as each revel in the other's creations, taking joy in their next awe-inspiring discovery of one another. It really is quite a beautiful thing - a subtle, yet powerful connection forms between the two of them without them even physically touching. Though I became invested in their romance, Marco did leave a sour taste in my mouth over Isobel. I felt she deserved much better treatment. I was most taken by Bailey and the Morgan twins. I connected with Bailey the most, I understood his enrapture with the circus and admired his personality. He first encountered the circus when he was a small boy; and on something as simple as a dare, he shared a brief encounter with a pretty red-headed girl who would stay in his heart for years to come. It wasn't until he was 16, facing a difficult decision and longing to escape the restrictions of his life, did the circus return and he saw that shock of red hair once again. It was a sweet and heartwarming bond that formed between him and the twins, and Bailey himself proved to be an extraordinarily vital element to the story. 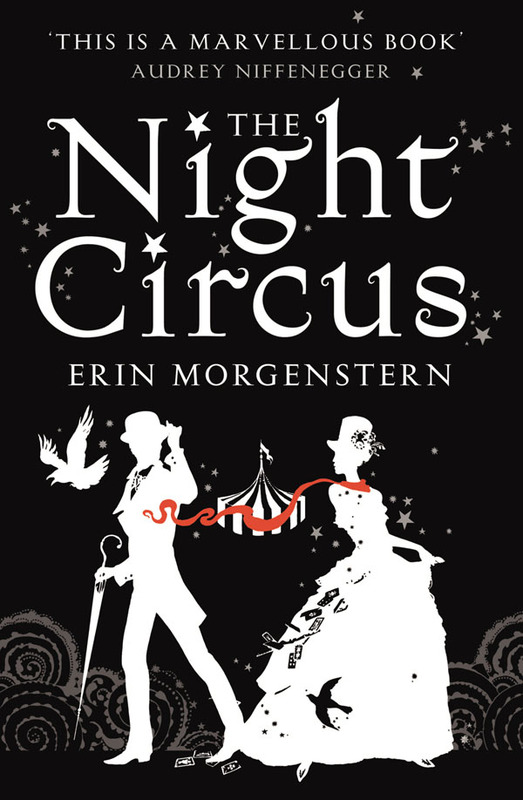 The night circus itself is a character, perhaps the most important and breathtaking of all (and for the first time, a circus that this animal-loving vegan wholeheartedly approves of). Morgenstern submerges you into this otherworldly and mysterious event, bringing to life each magical tent with a new and delightfully unexpected surprise hiding within each. She plays on your every sense, drawing you in so completely to the story that you can almost taste the caramel on the apples, feel the heat of the ever-blazing bonfire, the dazzling white chill of the Ice Garden or you find yourself secretly long to drop a stone in the Pool of Tears. You're right there alongside every other wide-eyed spectator, overwhelmed and unsure what to see first, where to go next; wanting to absorb it all in at once, but willing yourself to take it slow so you can savour every moment. The circus may appear black and white to the untrained eye, but as you explore deeper into it's heart, nothing is as simple or easily defined. Each character is fleshed out in an array of murky and colourful shades. Morgenstern build a history, a foundation for these characters, tangling their lives together quietly, often without you fully understanding how they will cross paths later. She builds and builds and builds, subtly forcing you to care. Nobody is of little significance. Everyone plays a role, everyone is affected by the magic at play, for better or worse. It's a slow moving tale, but where every word is an important element to the finished masterpiece. The Night Circus is an experience. A magical, romantic, dark and glittering experience, astounding in it's imagination. The story grows darker and more complex as cracks begin to show, and the game between Celia and Marco becomes clearer and more dangerous. But by the end, just as Bailey, Herr Thiessen and the many reveurs of the circus, you'll be wishing desperately to see the black and white striped tent greet you the next time you leave the house. To celebrate the release of THE NIGHT CIRCUS in paperback, the beautiful team at Vintage Books are hosting an 11 day blog tour to share this captivating novel with you all. Thanks to them I have TWO Night Circus party prize packs to giveaway, which are sure to spell a magical night for you and your friends! A paperback copy of THE NIGHT CIRCUS, reading guide, author interview, balloons, sweets and a Night Circus themed recipe! What would you find inside your own magical tent? Let your imagination go wild with your tent! Anything you could possibly dream - from the mundane to the impossible, whatever your heart desires. Personally, I'd like mine to recreate the walls of Hogwarts ;) Though I would love to visit the Bedtime Stories tent in the book, which features jars and bottles of all different sizes, each holding the essence of a memory that plays on your senses so deeply, you feel as if you're experiencing it in that very moment. It's truly amazing, which you'll see when you read for yourself! Be sure to check out the next fantastic stops on the tour! I would find shelves and shelves of all the hundreds and thousands of books I've ever wanted to read (including books that haven't been published yet)! Hmmmmmmmm. My magical tent? Well firstly it would be tiny on the outside but ENORMOUS on the inside (just like in Harry Potter!). And it would contain ABSOLUTELY ALL THE AMAZING BOOKS OUT THERE. As well as a bunch of SMOKIN hot guys. AKA Shane West. Ian Somerhalder. Mmmmmmmmm. Oh. And an enormous TV screen. With all the shows I could ever ask for. @____@ MY LIFE WOULD BE COMPLETE. Wonderful review Brodie! I love how you described all the circuses events! Sounds like a beautiful place! I love the sound of a book with a well developed background! I always loved the idea of working at a circus, like the one from Cirque Du Freak where every player can add a magical and wonderous act. Awesome review, Brodie! There are sentences in your review that are almost word perfect to mine! Lol. I absolutely loved The Nigh Circus, it's beautiful and amazing, and OH I WANT TO GO! It's just so enchanting, and charming, and I want to dive right back in it! Though my copy, some of the pages fell out :( So I'm entering contest to win another copy! Lol. In my tent, I would like to find bubbles. Bubbles that formed around you and supported your weight, and floated around the tent. Or a tent that held the most beautiful forest imaginable, that you could just get lost in! Yesss! I would find ANSWERS inside my magical tent. ANSWERS to all the biggest puzzlers of the world. Fantastic review, Brodie! Now you can see why I was so IN LOVE and deeply OBSESSED with this book alone. I just want more of the Night Circus's world . . . more of the author's writing . . . just NEED another book of hers asap! I've been dying to read this one and I don't know why I haven't. Great review! Great review ! I would love to have a tent like the one out of Harry Potter when they are camping, it would be so big inside ! One of my English professors was reading this book a few weeks ago, and she told me it was on her top five list of best books EVER read! I was so excited to hear that, especially since English Studies people read so much! Can't wait to check out The Night Circus for myself! Ahhh! BEST and worst question! My magical tent would contain all my best, precious, amazing, warm fuzzy moments. Life is (and has been for a while) blah and not the best so if I could relive some happy memories that would be EPIC. Meeting my best friend all over again would be lovely. I was in Kindy so I don't remember much but I do remember that the first time we locked eyes she thought I was a boy because of my super short hair back then. She must have thought I was a very beautiful boy, hehe :) First crushes and that giddy, breathless feeling that followed. When my sister and I used to make up dance routines or the time we got married. Along with all these delightful memories of mine, I would also be able to read the persons feelings and how they felt in that moment. Also, I would be able to visit people I used to know, how they are now, see what their up to and their memory of me. Also, in this tent I would be VERY photogenic. But most importantly in this tent I would be happy, healthy and well. Mmmm...really hard to choose but it would have all the tings I love and also bits from other tents of the Night Circus. For example, the bottled up memores and Cloud tent. In my tent i would also have classic children stories like Alice in Wonderland and of course of fave TV show, like, Doctor Who. In my magical tent I'll find everyone I ever loved and will come to love. I have had this in my TBR pile since it came out, i want to read it and your review confirms why..i seriously need to start. I love your review! You make me wish I had the book here with me, but sadly it's stuck at home. I hope to get it soon, so I can devour this magical and awesome-looking story! I'm so glad you enjoyed it! :) Can't wait to read it! In my tent i would like lots and lots of books. My tent would contain shelves of books! Oooh, I just borrowed this from the library, and I so agree - it's got the most beautiful descriptions. You sum it up perfectly. I'd want a tent of Marco's illusions, where I could go into whatever book I wanted and explore and interact with the characters. I'm dying to read this--looks epic! Thanks for the contest Brods! I've been waiting to read this until I could give it proper time--I'm so sorry for the slow comment! Ahaaah, Brodie, I read your entire review with a smile on my face and goosebumps all over... it sounds, quite simply, like pure and simple magic. And you've captured it... well... perfectly. You have made this sound absolutely magical! I'm sure I've heard a lot about this but I forgot most of it so reading this review was like finding out about a new book! So many books that couldn't possibly fit in a normal tent!!! When you open each book, it takes you into the place where the book is set, and you can become any of the characters you want. Aahhh, if only that was true! Waiting On.... Some Kickass Heroines! Interview & Giveaway with Julie Kagawa! Chapter Excerpt from SPARK by Brigid Kemmerer! Storm Blog Tour: Giveaway Winners! ARTICLE 5 Sequel Title Reveal + Giveaways!